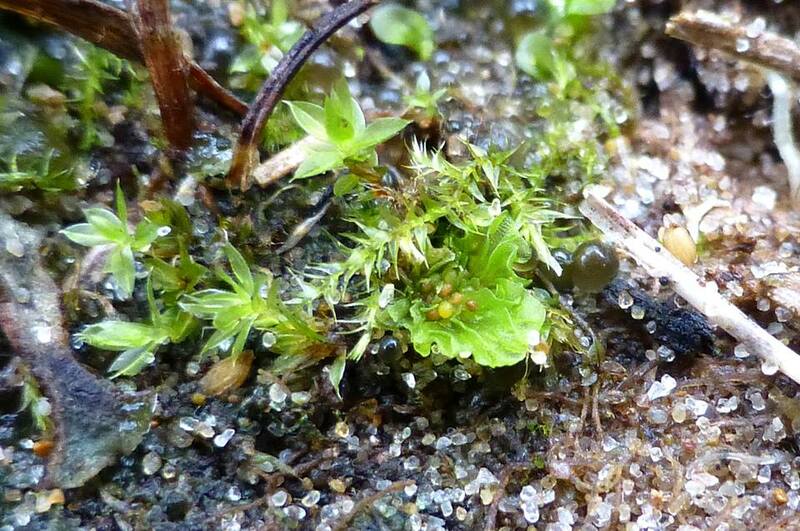 Bright sun is never to be wasted at this time of year, so I spent a bit of time out on the mosses today. Common Buzzard, Merlin, Sprawk and Kestrel were all predictable while the Fieldfares on Plex were as nervous as ever – powering away to higher branches. So jittery – cyclists, cars, anything really, sends them up and away. They don’t even seem to like sitting out in the sunlight. 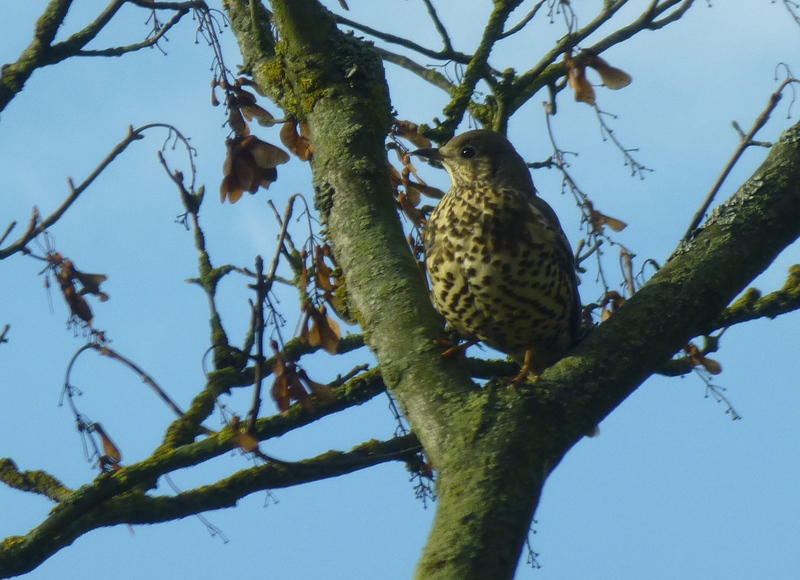 Gorgeous thrushes of course, I was just sneaking up on their blind side when my mobile phone went “beepity beep beep” to inform me of the absolute necessity of mustard and Worcestershire sauce at Dempsey Towers and off they went, scolding me for pants fieldwork. Local Corn Bunts were dozier than ever in the hard sun. Over on the Withins, the Pinks were being spooked by the Microlites, and jumpy as hell, but a Merlin held fast, scanning the stubble for Skylarks and finches from a low mound of earth. A feeble attempt by the sun to break through the misty stygian this afternoon was enough for me to make a dash for the marsh; better the constant roar of the traffic than the gathering storm that was a morning in town on shopping duties. I had a list and everything. Gloom had blotted out the sun again by the time I walked north from the sandplant, but at least the plastic Ross’s was bright enough to allow me to attempt near-dark digiscoping by Polly’s Creek. Pinkies, Wigeons en masse, Merlin and a Great White Egret in the murk before it commuted to the Marine Lake with the rest of the egrets. Possibly more enjoyable was yesterday’s hunt for Armadillidium Album – our very own rare woodlouse that lives exclusively amongst driftwood above the strandline at certain points along the coast. 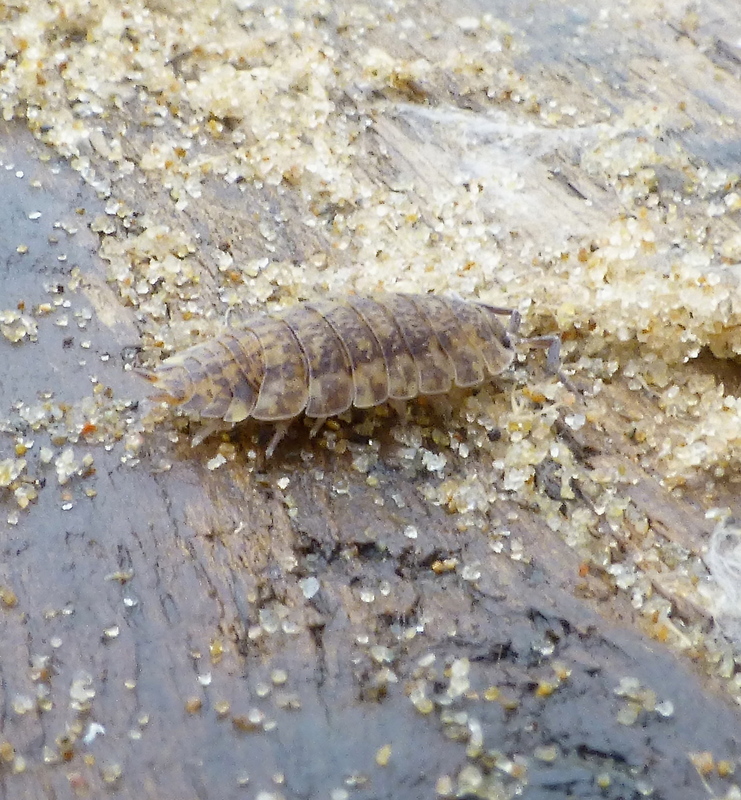 Tension was mounting after I dipped on the tideline at Ravenmeols, largely I fear down to the disappearance of most of the driftwood down there (this pill-bug is nationally rare and relies on the driftwood – so don’t take it’s habitat home for gardens or fireplaces). Managed to finally score on the Green Beach though – strange how even a woodlouse sp can have different behaviours than its relatives – who’d of thought it? While the pill-bugs in your garden curl up when hassled, this guy either sits still, or curls only slightly, showing its shapely pale legs. Fine sandy splotches on its carapace too (if carapace is what you call their bodies) – another cool resident of this mega-coast. Aw c’mon, they’ve gotta be more interesting than an escaped little white goose. First time I peered outta the office window today and a fine male Velvet Scoter came batting past – bigger and more powerful than the Commons whizzing everywhere off Ainsdale. Sod’s law – froze my bits off looking for one yesterday and fluked one today, but that’s how seawatching goes. Got even better when another male Velvet went past in the company of a Common Scoter about half an hour later. Both male Velvets seemed to like flying higher than the Commons, and both were well to the landward side of the “scoter ribbon” offshore, so I had great views in the excellent morning light – delighted to finally see ’em again off Ainsdale this year. I wonder just how many lurk in the scoter horde? A proper seawatch would probably have repaid the time today, but I have to work sometimes. Good tide tomorrow shortly after 1215 (Ainsdale) and calm-ish too, so it could be worth a punt late morning. Slow outta the blocks this morning, although to be honest, there’s rarely much to be gained from a dawn patrol when you’re this late into November. 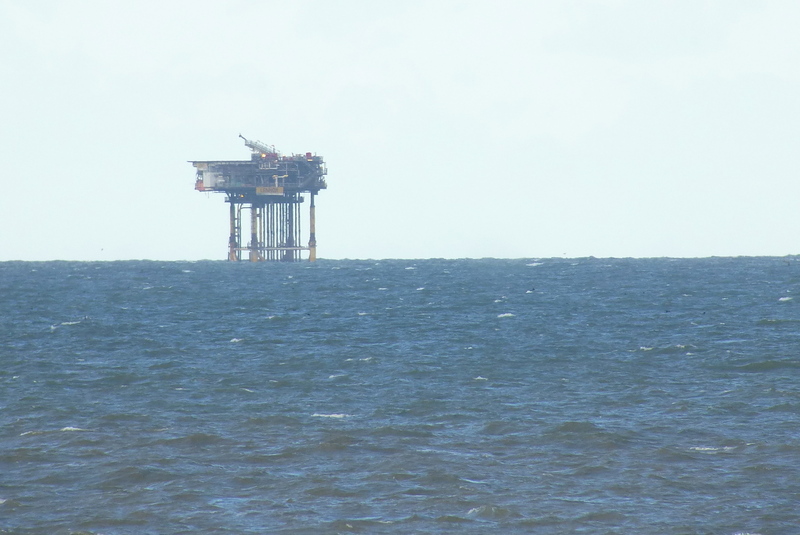 Wanted to give the scoters off Ainsdale a good grilling – they’ve been there since July, and while I can see ’em distantly from our office everyday, they’re too far off to work through properly. 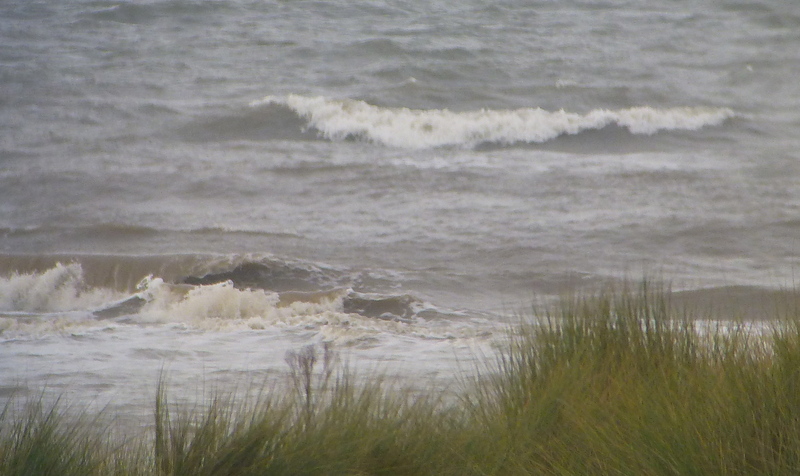 Got down to the dunes by the ADC at 1100 on the height of the tide, but the W/NW breeze was putting too much chop on the water, and the swell made it hard to work through the scoters (and everything else for that matter). There are however, worse things in life than a bit of chop on a chilly November seawatch, and 4 flyby Eiders (1 male, 3 females) were a fillip for the frozen. Sitting still you get cold pretty fast at this time of year, and it wasn’t long before I’d lost all feeling south of my armpits. The scoter horde continues to intrigue though – this long ribbon of birds that stretches from Birkdale to Formby must have something out of the ordinary with it, there’s thousands of ’em – it’s just a matter of getting a good enough view and a large enough dose of luck I suppose. By midday the sun had broken through and as all salty seadog seawatchers know, this throws an annoying “silvery” cast on the already pale underwings of Common Scoter, making Velvet double-takes way too frequent. Time to call it quits – the scoters will be there another day. After calling at the NW Bird Fair this morning I decided to nip in at Mere Sands Wood – the sun was shining and once I’d said howdy to a few folk and decided I didn’t really need to buy “The Field Guide To The Pseudo Saw-wings of Sulawesi Vols 1 & 2”, I felt I’d done what needed to be done at Martin Mere. Mere Sands was looking fine – nice and autumnal, although the mutts in the kennels next door were going berserk – someone must have told them the loudest barkers got double rations….don’t think I’d fancy sneaking through there with a pound of snorkers in my pocket! 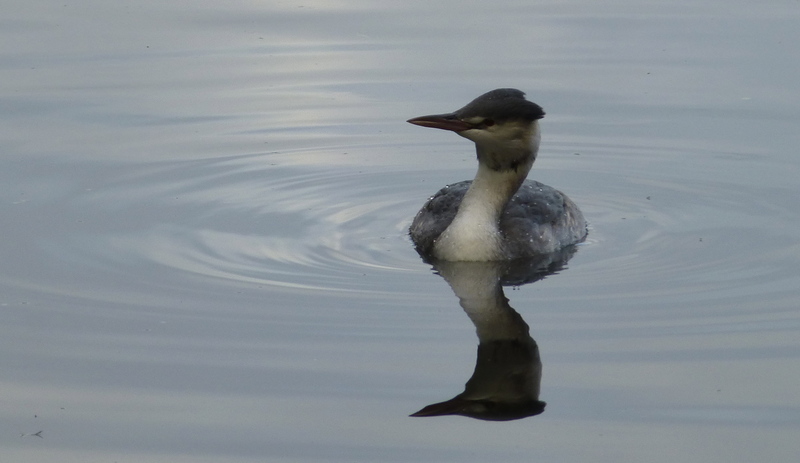 At least nine Goosanders on the water, with Goldeneye, Great Crested Grebe and the regular dabblers. Feeding flocks were a bit thin on the ground, although a male Sparrowhawk perching prominently by the water may have had something to do with this, as might the vital rhodedendron clearing work (chop it! burn it! kill it!) going on at the moment. 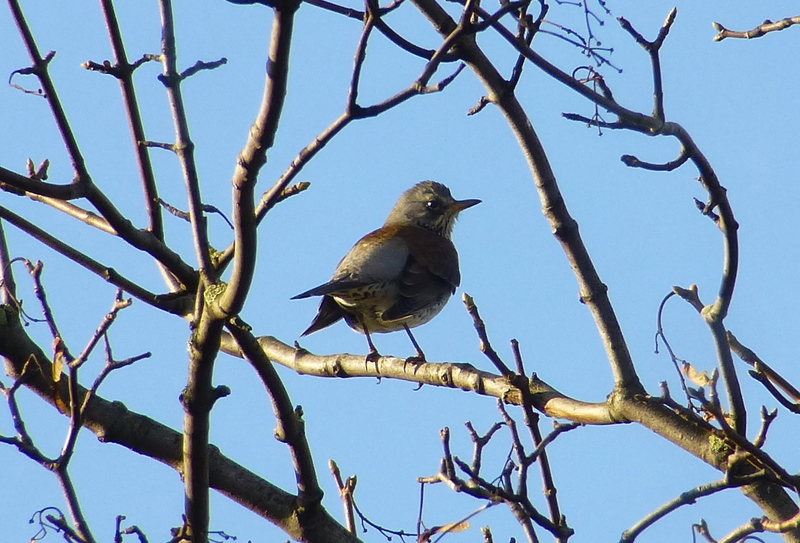 Still came across Tree Sparrows, Greater Pecker, Nuthatch, Goldcrest, Jays, finches and titmice though. 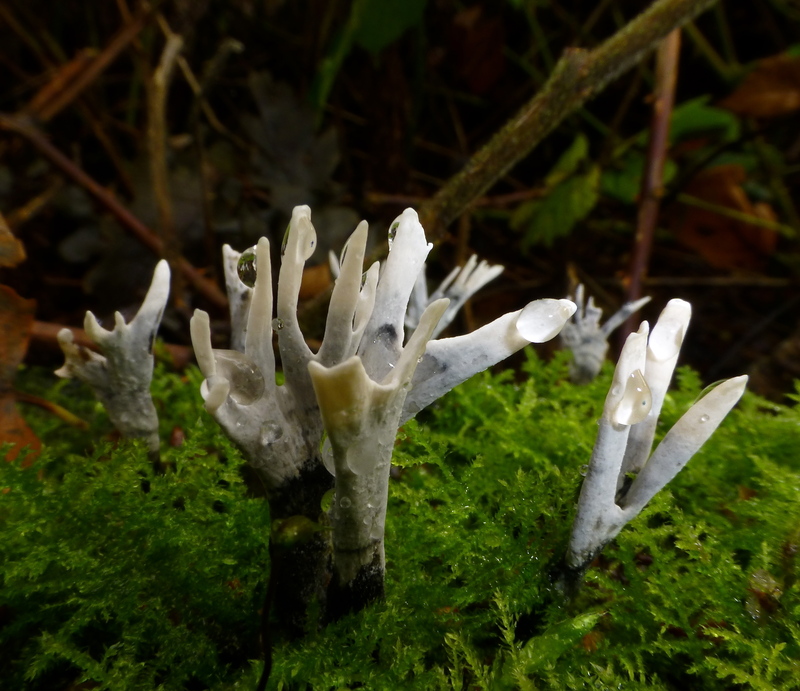 Water Rails shrieking round the Redwing Hide and plenty of funky Candle-Snuff Fungi to play with. I like Mere Sands – mebbe it’s ‘cos I spend so much time in the open habitat of the dunes or staring at the sea, that this patch of deciduous woodland is so attractive, but I always enjoy a walk round here. Made my way back over the mosses, stopping to watch the winter flock of Fieldfares stuffing their faces with hawthorn berries on Plex in the fading afternoon light. Once I’d blanked out the constant barrage from the nearby shooting wood, it was fairly peaceful on Hesketh Out Marsh today, barely any breeze, late afternoon light, and Little Egrets radiating fishing zen despite a fine Peregrine keeping an eye on proceedings from the back of the marsh. 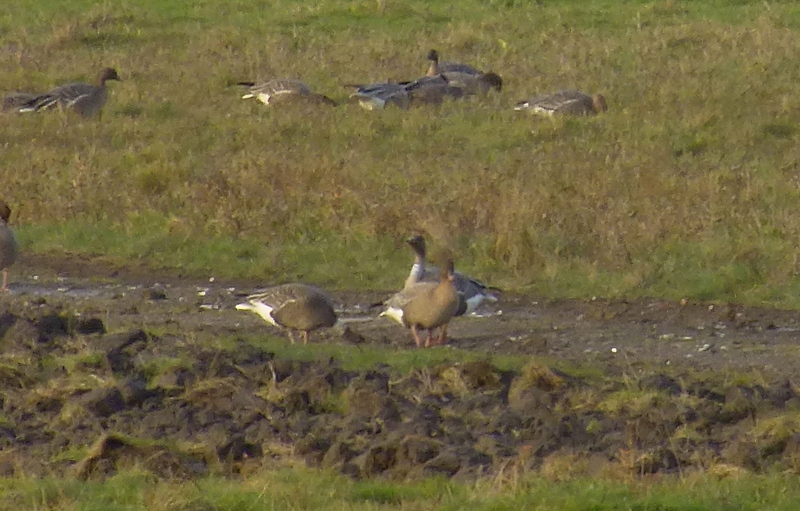 A few thousand Pinks there, including a leucistic bird and two with neck collars on, but I couldn’t get the numbers in the fading light – I’m sure a regular has nailed ’em already. 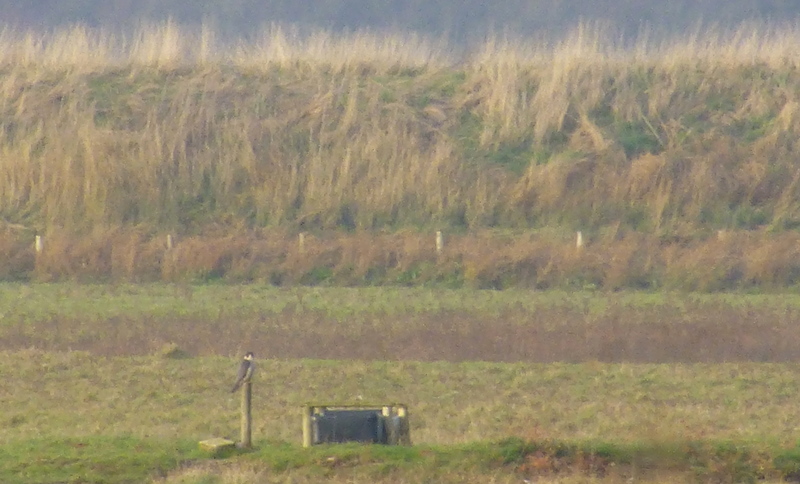 Kestrel and Merlin about as well as the Peregrine, with a herd of Whoopers on the road out to Hesketh Bank. Yesterday I took a turn over the mosses, and came across some truly prodigious piles of manure and potatoes – now I’m no expert, but I think they’re something to do with farming. 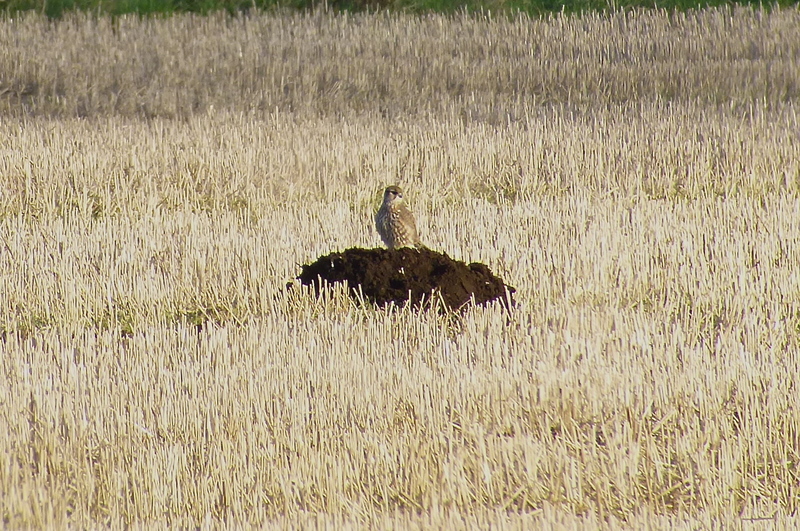 Back in the good old bad old days, these piles would be a magnet for Short Eared Owls in winter, but it was down to the Common Buzzards to go “rat prospecting” around ’em yesterday. 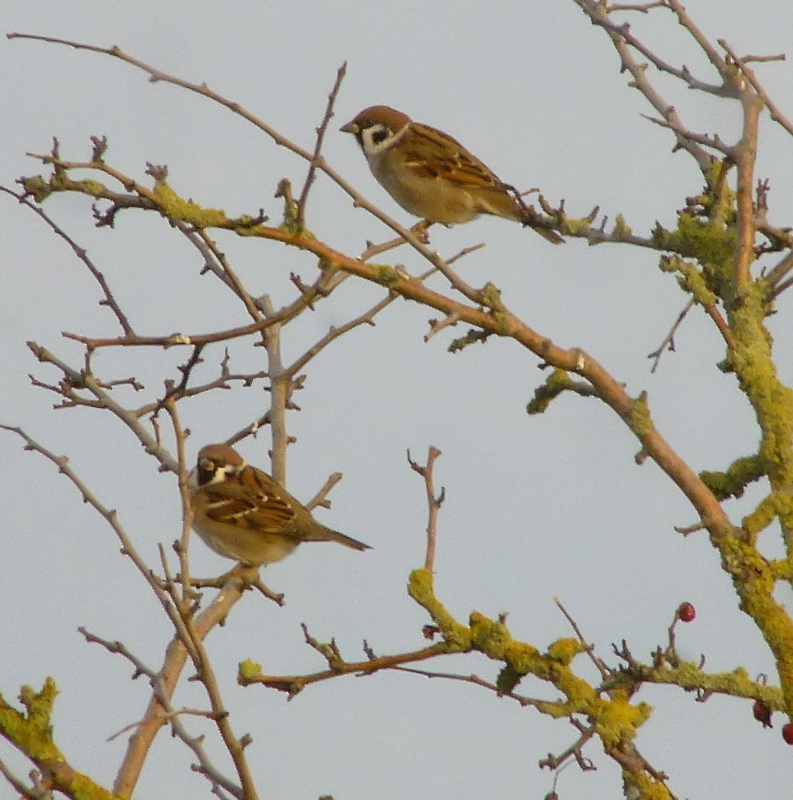 Bird of the day today though was a Tree Sparrow at Dempsey Towers in Ainsdale – I’ve heard it calling for the last few mornings, but nine this a.m. was the first time I’ve had a glimpse of it – a garden MEGA, only my second in the back garden in 15 years, hope it sticks around. The flock at HoM was nice and showy this afternoon too, swapping perching rights with Linnets just south of the car park. Bare branches clawing watery skies, numb toes and all that stuff – ah yes, it could only be November on the mosses. 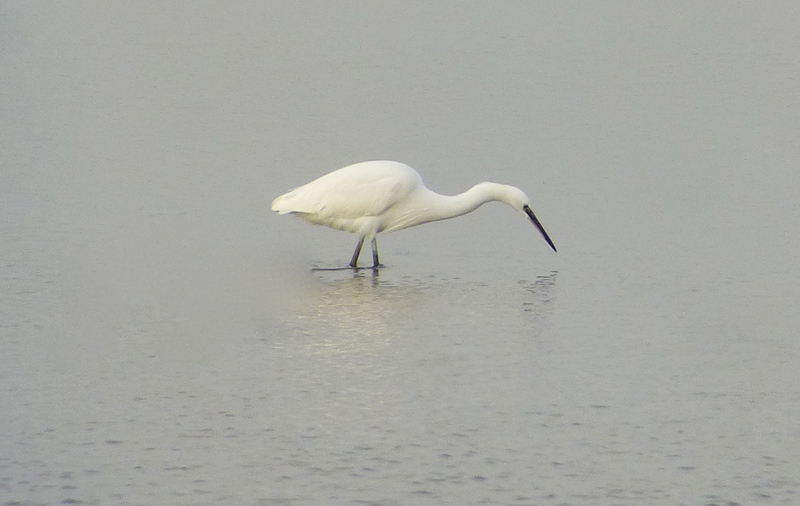 Didn’t seem that unreasonable given the recent excellent run of local birds which have included Lesser Snow Goose, Great Grey Shrike and Cetti’s Warbler, plus a Pom and a Leach’s Petrel for me in the fallout from Hurricane Gonzalo. A few young Rooks amongst the corvids on Plex, and while the newly laid track has slightly taken the edge off motoring over there now, it’s still quite possible to steer into ditchy oblivion if you bird while driving…always a fun combination. Skylarks and Linnets in the stubble, Yellowhammers in Haskayne Cutting with Common Buzzards and Mistle Thrushes but no sign of the ringtail Hen Harrier that has been out there. Mossland Saturdays tend to be very shooty shooty bang bang, so it may be better tomorrow. No Rough Legs, but any week with Petalwort in it can’t be bad – never been Petalwort hunting? 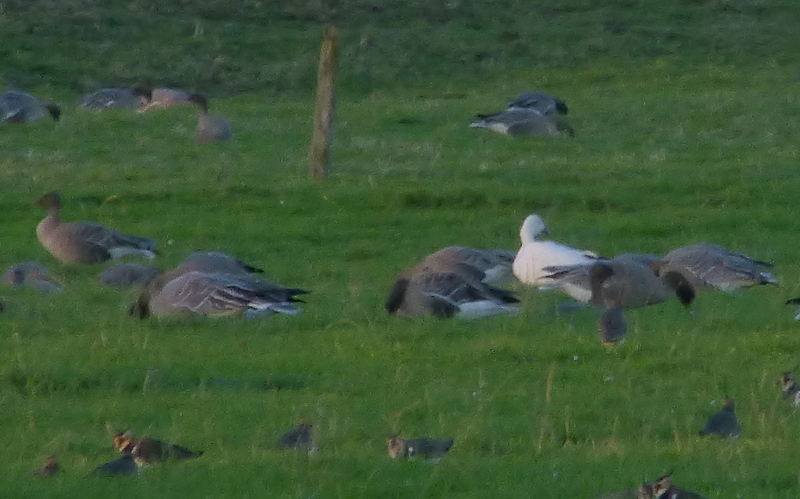 With the last of the light: Lesser Snow Goose, Formby/Downholland Moss. The combination of an early dart from work, clear blue sky and late sunny sun, plus a big rising moon meant it was still bright enough to catch up with the Lesser Snow Goose on Formby/Downholland Moss this afternoon. 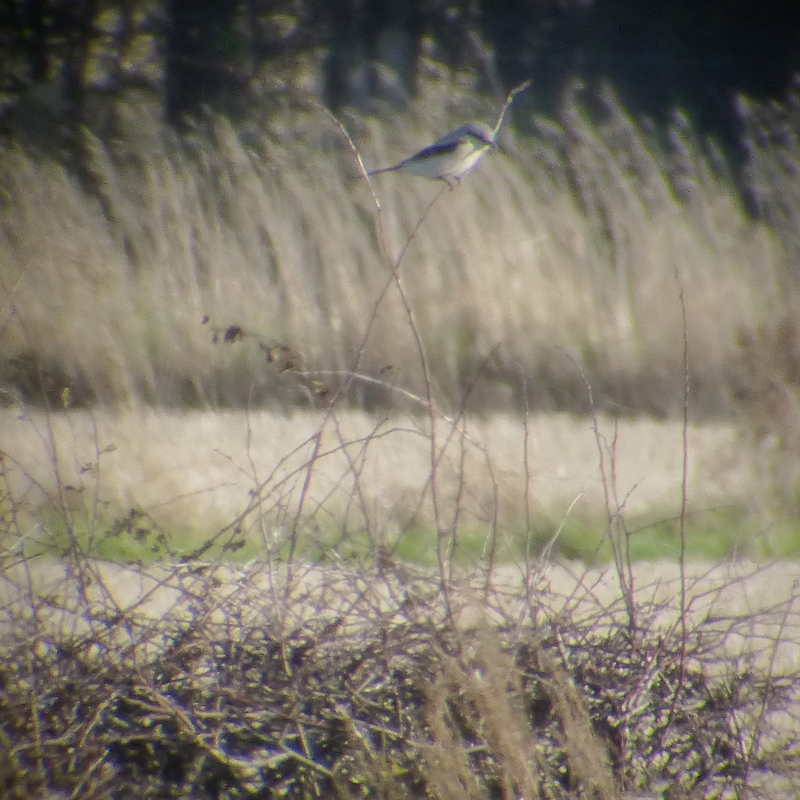 A nice bright one, with crisp black primaries…checked it for the requisite number of wings, beaks and feet – yup, all present and correct – then enjoyed the bird as it grazed amongst the Pinkies and Lapwings. 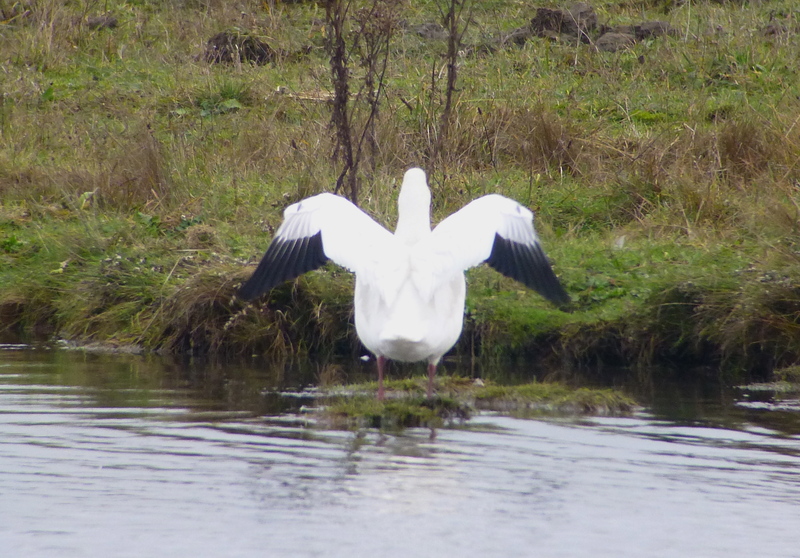 Say what you like about Snow Geese on the mosses, at least they’re easy to find (okay, apart from blue morphs) – a big green field, a few thousand grey brown Pinks and a great big white blob – bingo! No apologies for the pants image above – the light had just about gone when I stopped watching the bird feeding and tried digiscoping from the road, I’m sure there’ll be better pics of it about from folk who saw it in broad daylight earlier. 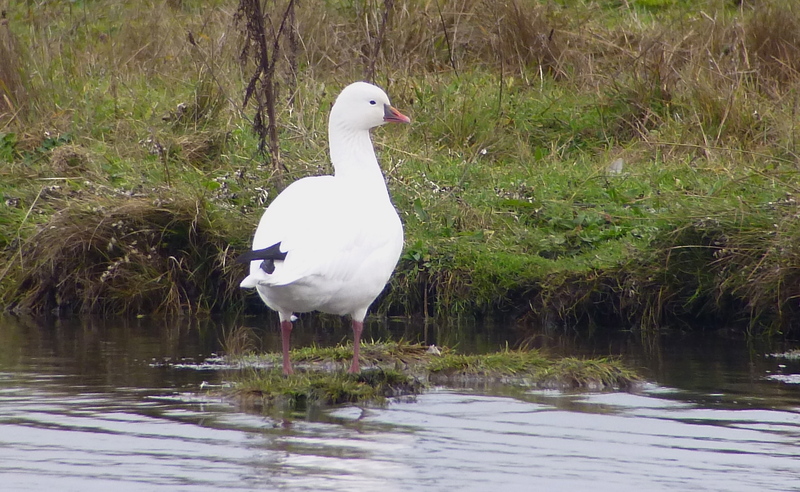 Think the last proper Snow Goose I saw locally was on Downholland too. Splendid drive-by tickage of it though by June Watt on her way to work – that’s the way to start a shift! 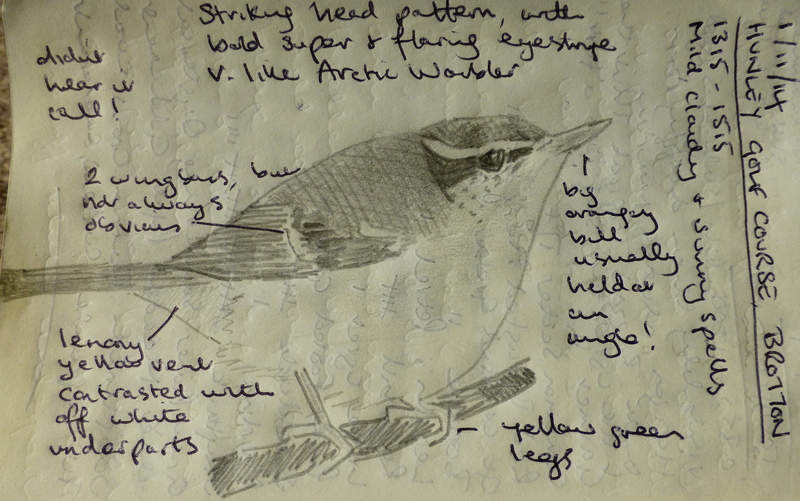 I was at Weld Road at lunchtime, where four Stonechats were flitting about. Weirdly they appeared to be paired up, males chasing and tussling whenever they got too close, and both being intensely protective of the females. 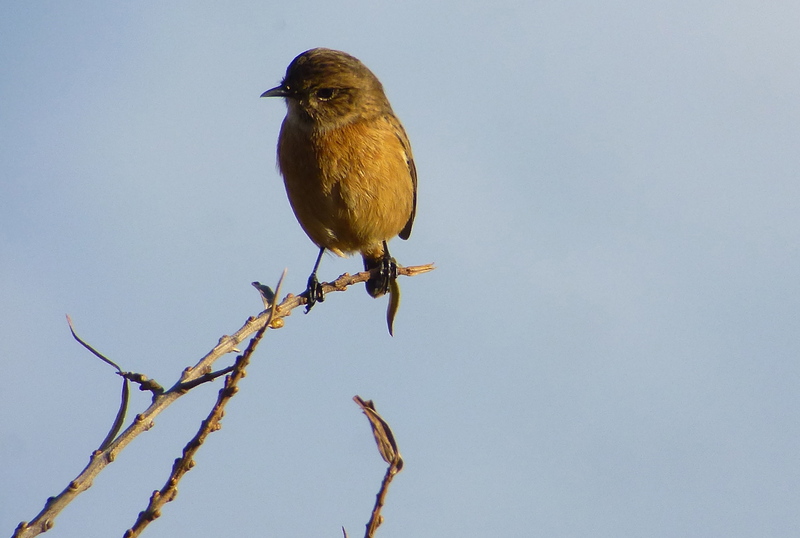 I know there are records of Stonechat breeding all year round, but I imagine a few cold nights should sort out that type of jiggerypokery this far north. 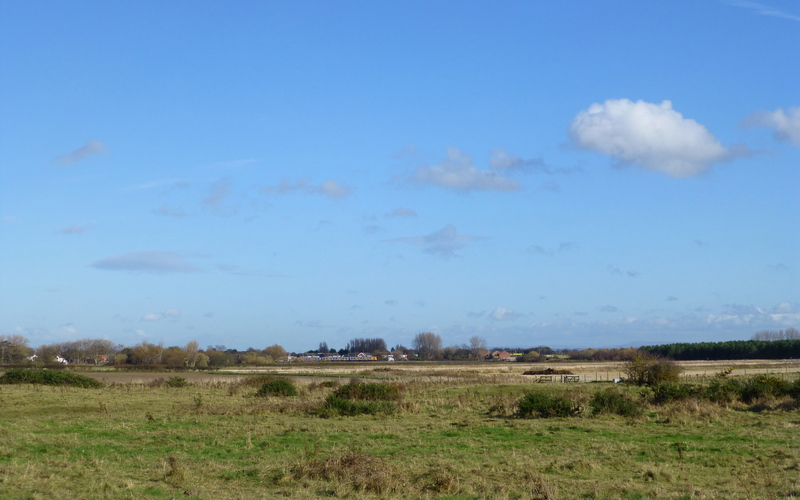 A few Twite in with the Linnets, but the place was so dog-raddled today (inevitable for a sunny lunchtime unfortunately), the finches never settled, heading out over the vegetation north of Weld Road and out of sight. 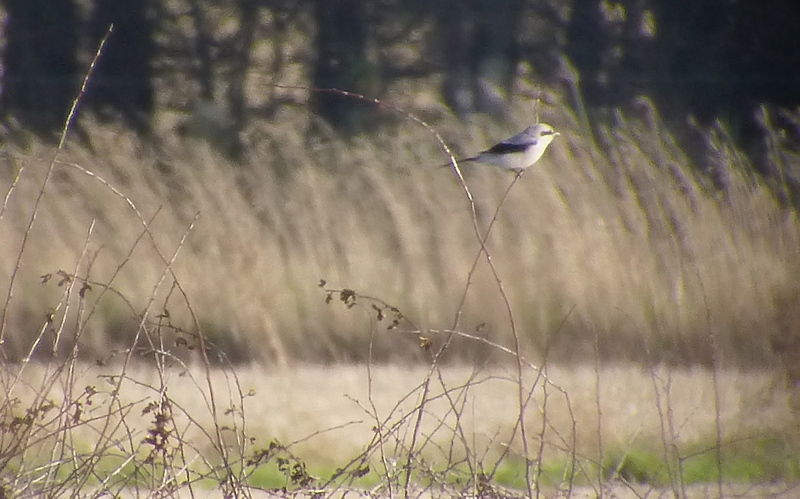 Excellent work from Tim Vaughan this morning when he found a lovely Great Grey Shrike in the grazing paddocks at Cabin Hill down at the end of Range Lane, Formby – fitting reward for his diligent patchwork at the site (along with Lawrence Atters of course). Nipped down from Ainsdale at lunchtime, parked up on Jubilee Road and walked down to see Tony Conway and Jack Taylor peering into the fields, which have been screaming “shrike” since late summer, and regularly hosting Whinchats and Stonechats (there were two of the latter there today and three under the office up at Ainsdale). Unfortunately for me the shrike had just dropped out of sight, having disported itself at close range earlier and it was another ten minutes or so before Tony picked it up again a gazillion miles away out on a hawthorn hedge out in the fields behind Marsh Farm. 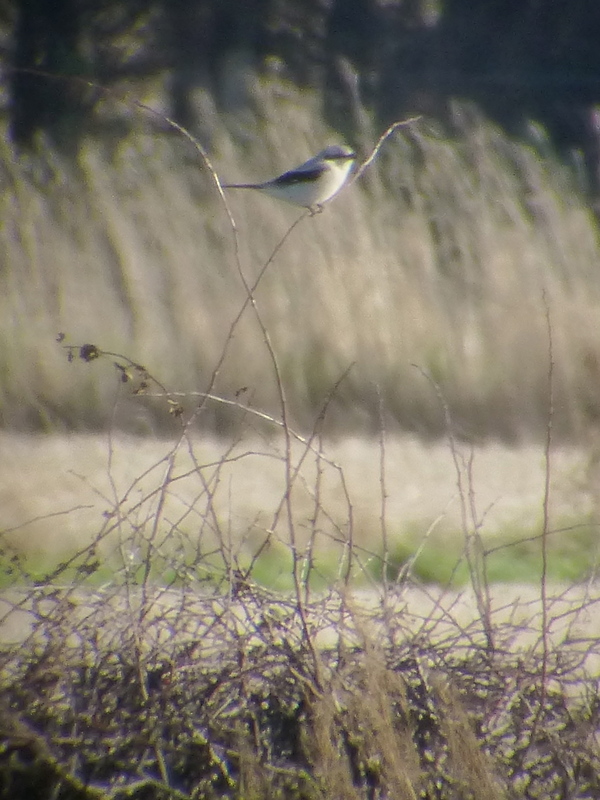 Distant though it may have been, you can’t beat a shrike for lunch. Hope it goes without saying, but if the bird is still around tomorrow, watch from Range Lane – do NOT enter the fields. Frankly I just got tired of everyone asking me the same questions – “Where’s the blog?” “Why don’t you do the blog anymore?” “I miss the birdblog?” etc etc etc. And I’m far too grumpy to post into the cuddly “thumbs-up” matey mate mate handbags social media-o-sphere, so here we go again. “All views my own” indeed – of course they are, why would you spend your time repeating someone else’s views unless you are a particularly unimaginative parrot? May post the last nine years of Birdblog somewhere as an archive, gotta work out how to do that yet – if anyone can advise I’d love to hear from you. Thanks for dumping the old server TM. Whizzed up to Cleveland yesterday morning for the Eastern Crowned Warbler, which was nice and easy…parked up, walked into the copse on the Hunley Golf Course, looked up into a stunted sycamore and there it was. 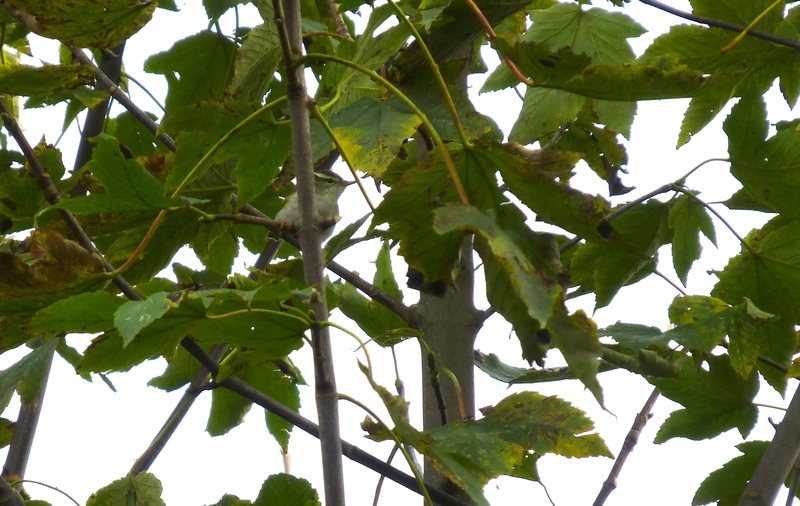 Weird the way it sat motionless like a flycatcher when not snapping up midges – except when you pointed a camera at it that is, then it just flitted up into the shrivelly sycamore leaves. 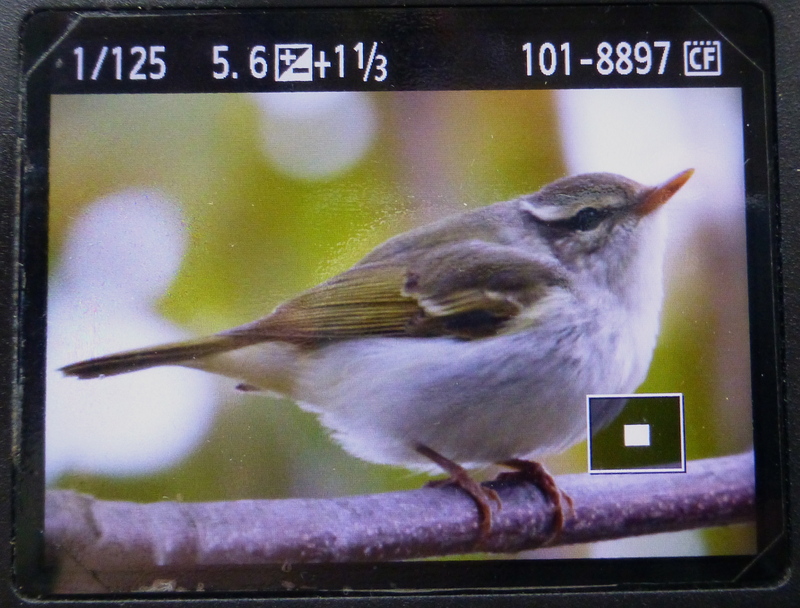 Missed the other North East one by a day (the pain of that is a fading memory now), so the humbug stripey head, weird orangey banana-bill and yellow vent were all good good good to see yesterday. 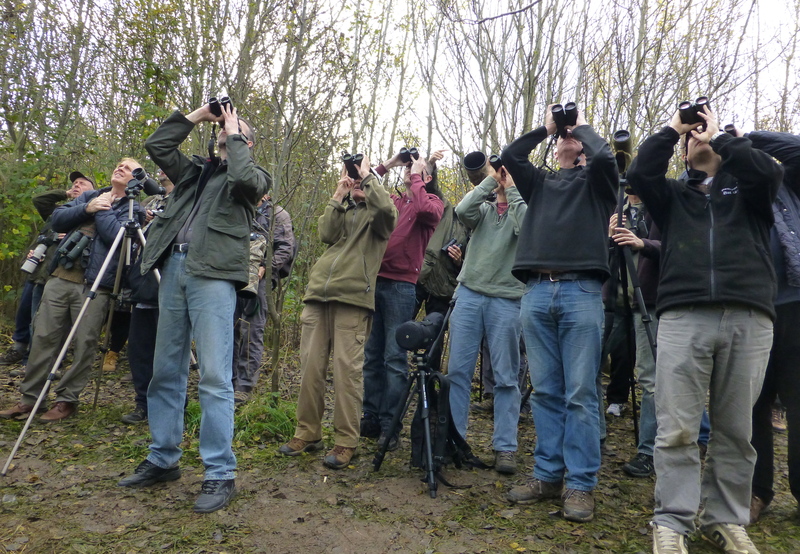 Watched it on and off for two hours in a reasonable crowd with plenty of familiar faces but I gave up trying to digiscope the warbler and resorted to digi-poaching the back of Bob Thompson’s Canon – many thanks for the image Bob, great meeting you! Yellow Browed Warbler calling in the copse too, with Chiffchaff and Bullfinches overhead before it was time to head home, only to be speed-gunned on the A1 travelling marginally faster than a Needletail backed by a following wind. Eyes to the…actually no, I’m not that guy anymore.